This White Premium Bunny Mascot Costume has puffy round cheeks and will hop into your heart. 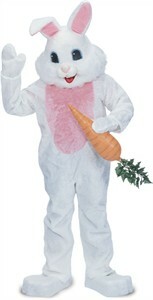 Availability: This White Premium Bunny Mascot Costume take 2-3 days to leave the warehouse plus transit time. Please note: This special order item is exchangeable only if an alternate size of this item is in stock. There are no returns for this item.